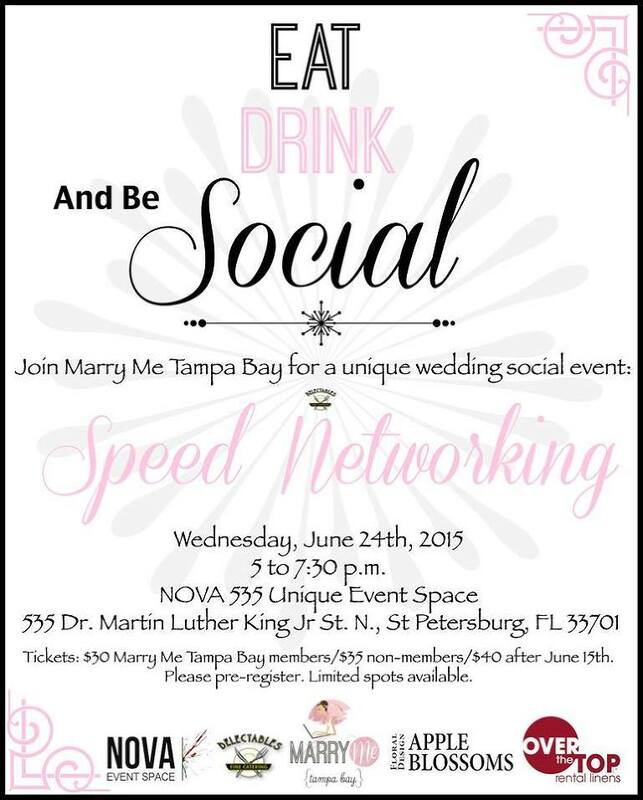 We are super excited for our SOLD OUT Tampa Bay wedding speed networking event at NOVA 535, and we wanted to share some advice with our fellow wedding pros on making the most out of the event. The purpose of speed networking is to not only meet people who you don’t already know, but it’s an easy way to make that initial introduction, so that you can schedule a follow-up meeting to connect on a deeper basis. Over 50 Tampa Bay wedding professionals are registered, so this will be a great opportunity to meet and mingle. Please make sure you arrive no later than 5:30 p.m. so that you can receive your table assignments. With such a large group, we have to start at 5:45 p.m.
Once the speed networking portion begins, you’ll have three minutes to speak about yourself and your business. Instead of delivering this in a one-on-one environment, you’ll be delivering this to your entire table, which will be 8-9 people. If there is time leftover (for some of us three minutes will be an eternity and for others 30 minutes wouldn’t be enough), the other vendors can ask you questions. After your turn, you’ll listen to everyone else at your table give their three minute speech, exchange business cards and then switch tables and do it all over again with a new group of people. (Please note, you may occasionally be seated with someone whom you just networked with, but we’ve tried to limit that as much as possible). With this format, you will meet with approximately 25 people during the Speed Networking portion, plus the opportunity to network from 5-5:45 p.m.
Word to the wise…plan your pitch BEFORE the event, so you don’t spend the first minute of your three minutes trying to figure out what to say. Lots of business cards…at least 60! Street parking only (Please do NOT park in St. Anthony’s across the street).